Some careless Manchester, UK police officer was doing some testing in a loaned Volkswagen Golf R, hit a roundabout, and destroyed the roughly $63,000 car. The British press is having fun with it, calling the Golf R a "Supercar." Yeah, right. And Margaret Thatcher was a Page 3 Girl. Police in Manchester were evaluating whether they wanted to add a Golf R to their fleet and were out on a public road at 2 am, possibly driving a little hastily, when the accident happened. The 40-year-old driver had to be rescued and is now suspended from driving duties. 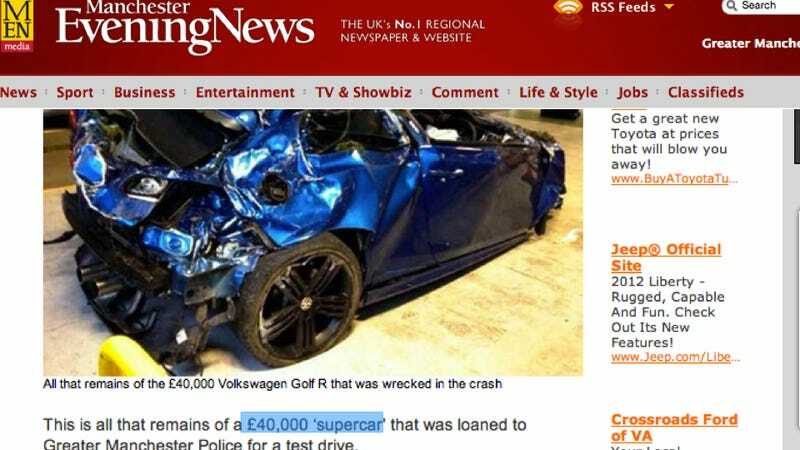 The car is totaled and being written off, which explains the headlines about the vehicle being a supercar. It's sexier if the police destroyed an exotic car. The Golf R is a great hot hatch, but a super car it isn't. It costs less than $100K, it has a top-speed below 160 mph, and it gets to 60 mph from a dead stop in more than five seconds.